Mercy Secondary School Ballymahon will hold our annual Open and Enrolment Night for incoming first year students September 2018 on Thursday 30th of November, starting at 7.00pm. All details may be obtained on the school website. Congratulations to students from our Leaving Cert class of 2017. 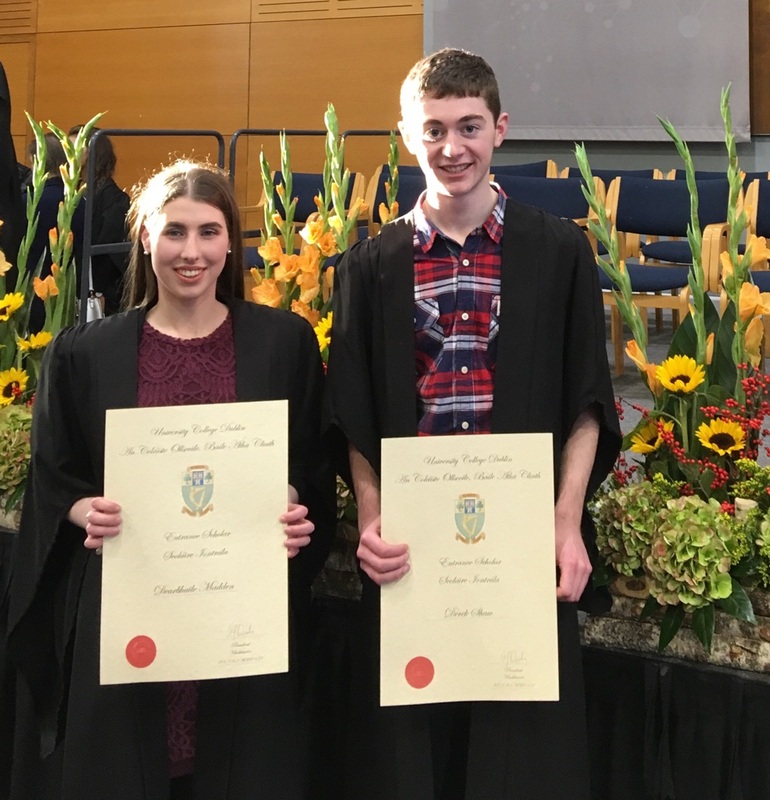 Emma Donohoe who was awarded an Entrance Exhibition Award 2017 from TCD and to Derek Shaw and Dearbhaile Madden who were awarded Entrance Scholars Awards from UCD. Derek and Dearbhaile will receive their awards at the Awards Ceremony on Thursday the 16th November. Emma will receive her Award at the Awards Ceremony on Tuesday 21st of November. Thanks to Ms. D. Daly and Mr. Tansey who arranged a river field study trip to Derrygonnelly for the leaving certificate geography students on Friday 27th October. This is part of the L.C.geography project which will be submitted by the end April 2018. This project is worth 20 percent of their final exam. The Senior girls’ football team, coached by Mr. Bohan, Mr. Munds and Ms. O’Reilly, won their match against Moyne recently. Hard luck to the U16 boys’ football team, coached by Mr. Dromey and Mr. Farrell who were beaten by Mercy Kilbeggan in a challenge game recently. The U16 girls’ football team, coached by Ms. O’Reilly and Mr. Bohan, lost their match against Loreto Navan on Tuesday 7th November. The U 16 girls’ basketball team won their game against Scoil Mhuire Longford recently and hard Luck to the U 19 girls’ who were beaten by the same opposition. Thanks to their coach Ms. Carr. Well done to Seadhna Ryan on winning Silver in the Connaught schools u16 swimming championships held in Claremorris. Seadhna will now compete for the Connaught Inter Provincial team in the spring of 2018. Thanks to Helen Emerson who presented a Cognitive Behaviour course on Mental Health to two of our TY groups. Thanks to Mark Mealia, Patrick Smyth, Patrick Conlon, Richard Sweetnam, John KilBane, Ella McMonagle, Niall McGarry, Ryan Shannon, Richard Prior, Katie Gouldsbury, Danny Hewitt , Liadhan Farrell, Gordon Farrell and Urte Vityte for visiting the Daycare Centre recently .